KNOXVILLE, Tenn. — Tennessee (13-7, 2-5 SEC) will play its final contest of a four-game home stand on Thursday night, as Florida (5-15, 1-6 SEC) comes to Thompson-Boling Arena. The 56th meeting between these schools in women’s hoops will get under way at 7:02 p.m. ET at The Summitt. The game will be streamed by SECN+. Tennessee enters the contest with pep in its step after beating LSU, 74-65, on Sunday in the annual Live Pink, Bleed Orange game in Knoxville. The victory was UT’s first since Jan. 3, ending a six-game overall losing streak and a five-game skid in league play. The Lady Vols lost four of those five SEC games by a combined total of nine points. Florida enters on a three-game losing streak and has dropped six of its last seven contests and nine of its past 11. UF’s only win in SEC play, however, came in Gainesville on Jan. 13 against Missouri, 58-56. UT lost to the Tigers in Knoxville, 66-64, on Jan. 6. Roger Hoover (play-by-play), VFL Steve Hamer (analyst) and Kasey Funderburg (sideline) will describe the action for SECN+. Guests who have signed up in advance are celebrating National Girls & Women in Sports Day with StrongHER! The StrongHER ticket package includes tickets to the game, a pregame event at the Women’s Basketball Hall of Fame (for 12 & under) and a T-shirt! High-Five Tunnel: Kids 12 & younger can pick up a wristband at the Fan HQ table on the concourse to participate in the pregame High-Five Tunnel. Wristbands are limited. To purchase discounted group tickets and reserve wristbands for your team, call 865-946-7000. Help us Spark the Summitt during introductions at the arena! Download our new free light-up app, courtesy of Coca-Cola. Once downloaded, simply open your Hoops Hype app when the lights go out, and let your phone do the rest. Tickets to the game are available for as low as $10 at AllVols.com. Free parking & shuttle service will be available from UT’s Ag Campus. Shuttles begin two hours prior to tip-off. Holly Warlick‘s squad is 7-1 vs. Florida during her tenure, including 4-0 away, 2-1 at home and 1-0 in SEC Tournament action. UT is 22-2 vs. UF in games played in Knoxville, 8-0 at neutral sites and 3-1 in overtime contests vs Florida, including 3-0 in Gainesville in those extra-frame affairs. UT is 21-2 all-time in games played in Gainesville, winning the past six trips there and in 12 of the past 13 visits, including 70-42 on Feb. 22, 2018. Last year’s 42-point total by the Gators was the second lowest score UT had ever allowed UF in Gainesville behind a tally of 40 in 2011. UF’s 14 second-half points last year tied for the fourth fewest by a UT opponent in a second half ever. Bashaara Graves’ free throw with 12.5 seconds remaining in regulation sent the 2013 game in Gainesville into overtime and helped give Holly Warlick a win in her first game as head coach in the series, 78-75. UT’s team record for most free throws made in a game (40-of-46) came at Florida on Feb. 3, 2005. Sophomore Rennia Davis tied her season high of 24 points to power the Lady Vols past LSU, 74-65, on Sunday afternoon at Thompson-Boling Arena in their annual “Live Pink, Bleed Orange” game. Sophomore Kasiyahna Kushkituah added a career-high 14 points and eight rebounds, while Zaay Green finished with 10 points and five assists. Davis also racked up seven rebounds while notching her fourth 20+ point game of the season. True freshman Jazmine Massengillalso registered a career-best 12 points, going 6-of-6 from the free throw line over the final 1:22 to help seal the victory.. The Tigers (12-7, 3-4 SEC) had three players with double-digit points, with guard Khayla Pointer leading the pack with 17 points and five assists. LSU junior forward Ayana Mitchell logged a double-double of 12 points and 10 rebounds. Back To Her Double-Figure Ways: With a season-high-tying 24 points, Rennia Davis logged her 14th double-digit performance and fourth 20+ effort of the season, breaking a four-game stretch in which she scored nine points or fewer. She opened the season by scoring double figures in 13 of her first 14 contests. Kasi’s Baaaack: Kasiyahna Kushkituah notched a career-high 14 points, recording her first double-digit game since leaving the lineup due to an injury in late November. Prior to being injured she’d scored 10 or more points in four of UT’s first five games. Owning The Paint: Tennessee outscored LSU in the paint 22-6 in the first half and went on to stretch the margin to 20 points, ending the day with a total of 44 points in the paint to LSU’s 24 points. UT has outscored 13 of 20 opponents in the paint this season. Turn ‘Em Over: The Lady Vols forced 25 turnovers against LSU, the most committed by a UT opponent since FAMU (32) and tying as the highest turnover total by the Lady Tigers this season. Tennessee capitalized on those turnovers, converting them into 23 points. Zaay Green was named the SEC Women’s Basketball Freshman of the Week on Jan. 29. The Gators returned two starters and six letterwinners from last year and welcomed six new players. Leading scorer Funda Nakkasoglu (14.9) and fourth-leading point producer Delicia Washington (10.2 ppg., 8.7 rpg., 3.7 apg.) returned and are once again 1-2 in scoring at 16.9 and 11.0 ppg. They are the only Gators in double figures. Head coach Cam Newbauer is in his second year after making the move from Belmont to UF. The Gators are averaging 61.1 ppg. overall and 57.4 in SEC games, while allowing 68.4 and 73.4. UF graduate assistant Sarah Wilkinson was a manager at Tennessee from 2014-17. Florida finished 11-19 overall and 3-13 in SEC play last season, tying for 11th place in the league. Key losses include Haley Lorenzen (12.3 ppg., 8.8 rpg.) and Paulina Hersler (11.8 ppg., 6.8 rpg.). Florida fell 83-73 to Arkansas Sunday afternoon at Exactech Arena in a back-and-forth contest that saw seven lead changes and four ties. The Gators built a lead as large as 15 points in the second quarter but weren’t able to slow down the high-octane Razorbacks, who scored 80 or more points for the ninth time this season. Funda Nakkasoglu, Danielle Rainey and Kiara Smith paced UF with 20, 17 and 16 points, respectively. Rainey and Smith posted double-doubles, pulling down 11 and 10 rebounds apiece. 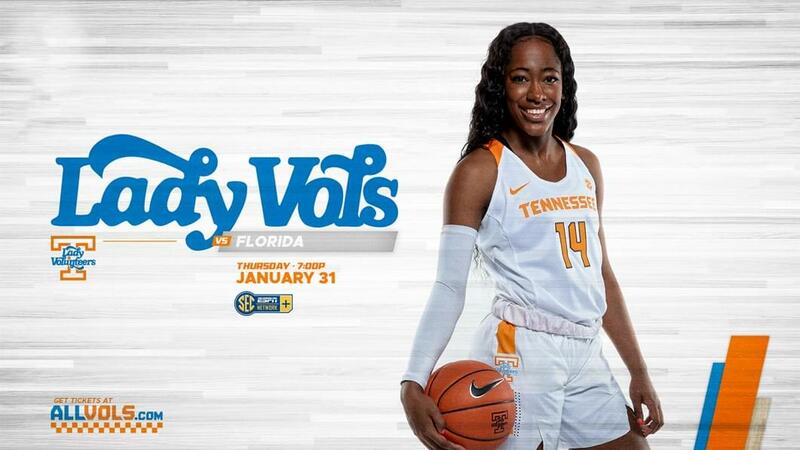 #15/14 Tennessee defeated Florida at Exactech Arena on Feb. 22, 2018, 70-42, giving Holly Warlick her 150th career win as a head coach (150-52) in her sixth season at the helm. The Lady Vols (22-6, 10-6 SEC) were led in scoring by Jaime Nared and Evina Westbrook with 13 each. UT had three other players in double figures, including Meme Jackson (11), Rennia Davis (11) and Anastasia Hayes (10). In a return to her home state, Davis added 10 rebounds to log her seventh career double-double. Florida was led in scoring by Paulina Hersler, who ended the day with 12 points and five rebounds. 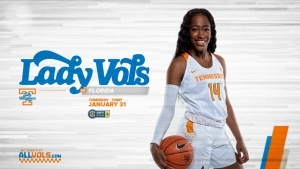 A late run by Tennessee helped give the Lady Vols a 74-70 victory over the Florida Gators on Senior Night at Thompson-Boling Arena on Feb. 23, 2017. Mercedes Russell led UT’s offense, getting her 16th double-double of the season, with 17 points and 10 rebounds. Diamond DeShields just missed a triple-double, posting 15 points, 10 rebounds and a career-high nine assists. UT got a late push of momentum in the fourth quarter to come back from a seven-point deficit. Over the last 2:57 in the contest, Tennessee (18-10, 9-6 SEC) went on a 13-2 run, starting with a layup by Alexa Middleton. She brought energy to the offense in the second half, finishing with 15 points and converting a trio of 3-pointers. Ronni Williams scored 22 points and grabbed nine rebounds for the Gators. After playing four straight at home, UT hits the road for a 2 p.m. CT (3 ET) Sunday matinee at Vanderbilt on ESPN2. UF, meanwhile, heads to Lexington to face Kentucky on Sunday at 2 p.m. ET (ESPNU).